We’d love your help. Let us know what’s wrong with this preview of At the Stroke of Madness by Alex Kava. With only an old man afflicted with Alzheimer's as a witness, FBI Special Agent Maggie O'Dell is on the trail of a serial killer who targets people with physical disabilities, removing each victim's imperfections to keep as a twisted trophy. To ask other readers questions about At the Stroke of Madness, please sign up. 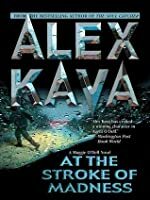 AT THE STROKE OF MADNESS is Alex Kava's 4th novel in the Maggie O'Dell Series and continues the life and work of the loner FBI agent. Maggie receives a telephone call, whilst on vacation, from her best friend and psychologist, Gwen Patterson, asking her to help her find one of her patients who has disappeared, whilst attending her grandmother's funeral. Maggie travels to Connecticut and begins an unofficial investigation, which soon turns into an official one when the body of a woman is discovered AT THE STROKE OF MADNESS is Alex Kava's 4th novel in the Maggie O'Dell Series and continues the life and work of the loner FBI agent. Maggie travels to Connecticut and begins an unofficial investigation, which soon turns into an official one when the body of a woman is discovered in an abandoned quarry, stuffed inside a waste drum. And as more bodies begin turning up, it becomes apparent that there is a serial killer on the loose. I liked the use of the multiple points of view, which gives you a look into the minds of the characters. You are constantly being misdirected by clues and twists, as to the identity of the killer. In the tomblike silence of an abandoned rock quarry someone is trying to hide their dirty little secret. A secret that reveals the depths of human depravity. A secret that is about to be discovered. FBI Special Agent Maggie O'Dell is just starting a hard-earned vacation when she gets a call from her friend, psychologist Dr. Gwen Patterson. One of Gwen's patients is missing on a trip to Connecticut. Can Maggie look into Joan Begley's disappearance? At first Maggie dismisses Gwen's concern. But whe In the tomblike silence of an abandoned rock quarry someone is trying to hide their dirty little secret. A secret that reveals the depths of human depravity. A secret that is about to be discovered. At first Maggie dismisses Gwen's concern. But when the body of a woman is discovered buried in an abandoned rock quarry in Connecticut, Maggie heads to the small town on "unofficial" business to see if there's a connection to Joan Begley. Soon the shocking news surfaces that more bodies have been discovered. And before she realizes it, Maggie is drawn into a case that confounds both local law enforcement and a seasoned criminal profiler like herself. The question remains: Where is Joan Begley? Is she in fact the woman discovered buried in the quarry? Or is she the unwilling guest of a killer obsessed with possessing an unimaginable prize from his victims? Regarding the mystery itself Maggie finds herself in the middle of a possible serial killer crisis when she goes to check on a patient of her friend Dr Gwen Patterson who went missing. The book has several interesting secondary characters - the sheriff, Dr Bonzado and even the killer - but somehow none of them is fully developed. It takes a while to understand what the killer is doing and I never really felt he was such an evil character as his actions made him to be. One of the main characters of the story is Luc Racine, Julia Racine's (that we've known is earlier books) and he seems to be the object of the killer's attentions but the fact that he suffers from Alzheimer make his statements unreliable and Maggie ends up staying with him. I thought that him being Julia's father would have some relevant purpose but it's not so... the same with some of Maggie's emotional baggage which doesn't really add to the story. After the last book I would have preferred that she made peace with her mother. Besides the end was a bit strange with Maggie deciding to go hunting the killer with no back up other than Racine whose memory cannot be trusted. It was too naive for an experienced woman like she is. Alexa Kava keeps getting better and better! Nothing typical about this book. Starts out on a lovely mountain top to the tune of a chainsaw! As "Elvan" says, lots of red herrings - which I love in a book, keeps my brain working! Poor Maggie O'Dell always gets herself in some sort of bind, plus she has a habit of marching to her own tune,and as good as those intentions are, they most often lead to trouble. A new character introduced in this book - I'm assuming this character will show up in future bo Alexa Kava keeps getting better and better! Nothing typical about this book. Starts out on a lovely mountain top to the tune of a chainsaw! A new character introduced in this book - I'm assuming this character will show up in future books. Again, I fully recommend this series to those of you that like a good murder(s) mystery/police procedural. To a certain extent, its fair to say this isn't what I'm looking for. I look my murder mysteries to contain a tighter focus on the detective and the mystery, rather than a look at all the people around it. However there's other issues too, like the pacing - it goes nowhere for ages than all of a sudden ends - and I don't care much for all the pop culture references either. Intriguing but I'm not gonna race out to find the others. Well that was fun! Nothing says serial killer like a guy going through the grocery store choosing jars of pickles and mayo so he has the proper containers to display his "trophies". I enjoyed this edition of the Maggie o'Dell series. I would have liked to see more O'Dell time but the creative nature of this particular serial killer was well worth the read. When w Well that was fun! Nothing says serial killer like a guy going through the grocery store choosing jars of pickles and mayo so he has the proper containers to display his "trophies". Great 4th book in the Maggie O'Dell series! An entirely adequate serial killer / FBI profiler procedural with a female central character. An interesting scenario and perpetrator; set in a small town with a decent whodunnit mystery wrapped up in CSI-type forensic detail. It sagged somewhat for me because I wasn't grabbed by the investigator, Maggie. Her troubled private life didn't add anything to the story for me and I was actively irritated by the over-used conflict between her and her superiors (in which she's gone off piste and is gettin An entirely adequate serial killer / FBI profiler procedural with a female central character. It sagged somewhat for me because I wasn't grabbed by the investigator, Maggie. Her troubled private life didn't add anything to the story for me and I was actively irritated by the over-used conflict between her and her superiors (in which she's gone off piste and is getting a hard time for it). On the plus side, the chapters are short and pacy, the writing is fluid and accessible and the plot wrapped up in a satisfying and credible fashion without dragging on in a tiresome, bullets and bravado, improbable set piece. There's plenty of menace without a gruesome amount of explicit torture-type violence. Overall, I enjoyed it. But would I go seek out more from this author? Not deliberately. But if I was stuck at an airport then I might pick one up. Maggie is asked by her friend, Dr. Gwen Patterson, to look into the disappearance of a patient. At the same time, several bodies are found stuffed into barrels in a quarry near the patient’s last known location. Is she one of the corpses? Who killed them and why? The plot is enjoyable and well-paced. The new characters are easy to like, and the killer's motivation is unique as far as serial killer’s go. The problem is that I did not get that “can’t put it down” feeling that comes with really good books. In addition, I felt that Maggie's character was under-developed. She does not seem to be growing or learning from her mistakes. She keeps getting herself into the same situations with the different killers in the series. I am interested to see where the characters are going, especially Tully and Gwen, so I will keep on reading. It was like a short story for a weekend but well-written and enjoyable. Loved the end. Oh I missed a book in the series but this one still engrossed me. 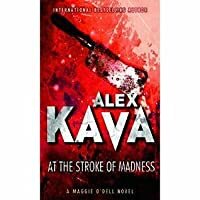 At The Stroke of Madness by Alex Kava, the 4th in the FBI Profiler Maggie O'Dell Series. I am greatly enjoying this series. Maggie O'Dell is finally taking a long-deserved vacation. Just as she's ready to pack it in, her friend Gwen Patterson calls for her help with one of her patients who she thinks is in trouble. All roads lead to New Haven County, Connecticut where Joan Begley was last seen...and the site of a serial killer's dumping ground. This by far is the best book in the series to date. We find a mentally healthier Maggie and get to see her in action as a profiler. The case is extremely interesting, if not r Maggie O'Dell is finally taking a long-deserved vacation. Just as she's ready to pack it in, her friend Gwen Patterson calls for her help with one of her patients who she thinks is in trouble. All roads lead to New Haven County, Connecticut where Joan Begley was last seen...and the site of a serial killer's dumping ground. This by far is the best book in the series to date. We find a mentally healthier Maggie and get to see her in action as a profiler. The case is extremely interesting, if not rather gruesome, with lots of red herrings to distract. Fortunately, I kept my eye on the prize clues and figured out the whodunit before the reveal. An average one. The worst part is the ending,it seemed so sudden. The novel moves at a snail's pace till the end,and at the end it's like 'fast and furious'. If he was going to create a serial killer,he could've created a better one. And then there is the it's-not-the-end-of-the-story line.. I saw a praise on the cover comparing him to Patricia Cornwell at her prime.. I can't understand since when did they change the meaning of prime to worst. This had a much better ratio of suspense to personal problems than the previous book in the series. Już kolejny raz mam problem z oceną książki. Nie chodzi mi o to, że "Granice Szaleństwa" to zły kryminał czy moja pierwsza przygoda z Alex Kava była nieudana. Po prostu uważam, że przy tym tomie autorka się nie postarała. Przede wszystkim jest on krótki, dlatego wybrałam go na pierwszy rzut (nie wiedziałam, że to cały cykl kryminałów). Podobał mi się, ale miałam wrażenie, ze autorce zabrakło pomysłu, szczególnie że jej inne książki mają grubo ponad 500 str. Kolejną rzeczą, jaką dostrzegłam w powi Już kolejny raz mam problem z oceną książki. Nie chodzi mi o to, że "Granice Szaleństwa" to zły kryminał czy moja pierwsza przygoda z Alex Kava była nieudana. Po prostu uważam, że przy tym tomie autorka się nie postarała. Przede wszystkim jest on krótki, dlatego wybrałam go na pierwszy rzut (nie wiedziałam, że to cały cykl kryminałów). Podobał mi się, ale miałam wrażenie, ze autorce zabrakło pomysłu, szczególnie że jej inne książki mają grubo ponad 500 str. Kolejną rzeczą, jaką dostrzegłam w powieści, był charakterystyczny sposób prowadzenia rozdziałów. Bo sam styl niczym się nie różnił. Tylko w powieściach Kavy jest specyficzne to, że rozdziały sa krótkie i zazwyczaj opowiadane z punktu widzenia różnych bohaterów, którzy "wymieniają" się w poszczególnych rozdziałach. Dlatego czasem można było się pogubić. Co do zagadki kryminalnej, to szokuje, ale samo rozwiązanie nie jest niczym nadzwyczajnym. Czytelnik nie ma prawa domyślić się, kim jest morderca, gdyż nawet nie zna tej postaci. Nie posiadamy imienia i nazwiska. Kolejnym problemem jest brak możliwości czytania tego tomu bez znajomości poprzednich. Nie tylko tu chodzi o bohaterów, ale także o wydarzenia, które miały miejsce w poprzednich książkach, może i nawet rozwiązane sprawy. Recommends it for: those who enjoy suspense! When I started reading the 4th O'Dell, I was disappointed because Nick seemed to have disappeared. I guess after reading the 1st, 2nd, and 3rd book, I expected him to be a vital part of the series. I wasn't sure if I could imagine him out of Maggie's life, but I continued reading and was not disappointed at all. I don't care to give much about the book because I'm afraid I might accidentally provide a "spoiler" - however, I will say this: Alex Kava will grab you by the throat and keep you spiral When I started reading the 4th O'Dell, I was disappointed because Nick seemed to have disappeared. I guess after reading the 1st, 2nd, and 3rd book, I expected him to be a vital part of the series. I wasn't sure if I could imagine him out of Maggie's life, but I continued reading and was not disappointed at all. I don't care to give much about the book because I'm afraid I might accidentally provide a "spoiler" - however, I will say this: Alex Kava will grab you by the throat and keep you spiraling over, under, sideways and down. As I read book, I felt as if I was Maggie (she's become a part of me) :-) and by the end of the book, I was exhausted! I'm starting the 5th in the series now. I'm a speed reader and able to read the first 3 in less than a week. I want to be able to read the rest of the series by mid September. I highly recommend her books! Thank you, Alex Kava! An enjoyable and typical Maggie O'Dell book. My favorite part of the book was Luc Racine. Some of the book is told through his point of view and it is very interesting as he as early onset of Alzheimer's. I loved his little dog, Scrapple. We have the typical tropes that are becoming well known to Maggie O'Dell...hard headed to a fault, running of to dangerous places without telling anyone and getting herself into trouble and the book being wrapped up "off set" and the reader getting filled in at An enjoyable and typical Maggie O'Dell book. My favorite part of the book was Luc Racine. Some of the book is told through his point of view and it is very interesting as he as early onset of Alzheimer's. I loved his little dog, Scrapple. What a pleasure to immerse myself in this series which is so well written (fluid writing) with always a captivating scenario, endearing characters. In this tome the Maggie at the request of her psychologist friend is looking for Joan one of the patients of this one, she has disappeared and as decomposing bodies are found in a clearing she is worried. Especially since an organ on each body has been removed. When the murderer is going to feel threatening he will go out of his way. I recommend this What a pleasure to immerse myself in this series which is so well written (fluid writing) with always a captivating scenario, endearing characters. Kept me guessing throughout the book, pointing fingers at characters through the pages. 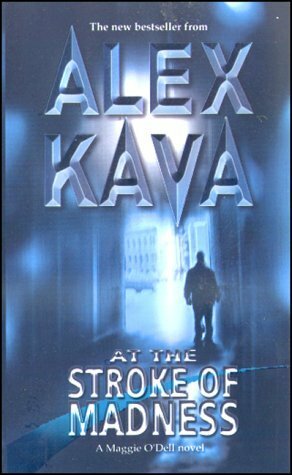 Alex Kava maintains a consistent writing style and story line book after book. I think in the whole Maggie O'Dell series, I was somewhat lost only once and that may have been when I started reading the series in the middle without realizing it was a series. I enjoyed this book. Good characters, nice plot, although maybe just a tad too much information on what goes on during an autopsy. Written in 2003 , the fourth Maggie O'Dell book. In this story Maggie is on vacation, while, looking for a missing woman, as a favor for a friend. A simple search and locate turns into "unofficial" business for FBI Special Agent Maggie O'Dell. I really like these Maggie O'Dell books. Alex Kava goes into great detail about the crime scenes and everything going on. The books so far have all intertwined with each other and I feel like I learned a lot more about Racine, Tully, and Gwen. I wish there had been more about Nick Morreli and Maggie. I am hoping more is to come about those two.